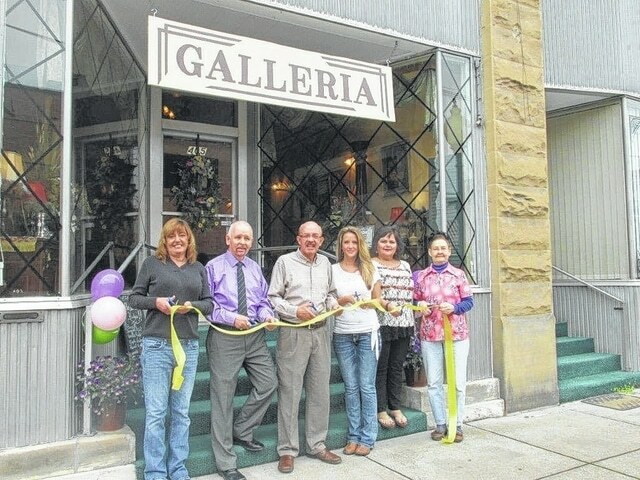 Welcoming Galleria Designs to Main Street in Point Pleasant with a ribbon cutting were, from left, Marcia Finley, of the Lowe Hotel; Paul Jones, owner of Galleria Designs; Point Pleasant Mayor Brian Billings; Point Pleasant City Clerk Amber Tatterson; Point Pleasant City Councilwoman Elizabeth Jones; and Carolyn Harris, of Main Street Point Pleasant. POINT PLEASANT — Something special and unique. These were key words for Paul Jones, owner of Galleria Designs, when he had designs of one of Main Street’s newest businesses. The idea for Galleria Designs came to him about five years ago. He wanted to provide customers with an unusual and new shopping experience in downtown Point Pleasant. Inside Galleria Designs, Jones has created an atmosphere that has the ambiance of an upscale antiques store in Savannah, Ga.
“It definitely has that Southern feel,” Jones said when showing off some of his latest additions. Items in Galleria Designs include Waterford crystal, classic mahogany antique furniture pieces, upscale estate pieces and status estate pieces which stand apart and take up their own special space on the display floor. Jones also sells gourmet fudge shipped fresh from a dealer in Chicago and also offers up a special brand of biscotti. Jones said he is always looking out for that unique item, from unique chairs and sofas to a reprint of the china pattern on the Titanic or a mahogany bankers desk with Chippendale handles, all of which are currently in the store. In addition, he also provides free, personalized gift wrapping for purchased items, does silk flower arrangements and provides unique gift baskets. Jones added he’s been pleased with the response the shop has received since it opened three months ago, having visitors from not only Point Pleasant but from around the area. Jones is a native of Point Pleasant and a familiar face on the local business scene. He was the original owner of Four Seasons Florist but moved from the area in the mid-1980s. A 1969 graduate of Point Pleasant High School, Jones returned a couple of years ago to care for his aging parents, Paul Sr. and Wanda Jones. Unfortunately Jones recently lost his parents, both within six months of each other. Despite some of the hardship, it did put Jones back in his hometown and as he put it, at 62 years old, he wasn’t ready to retire and this was the perfect time to pursue his dream of Galleria Designs. “I wanted to give the people of Point Pleasant something new and different,” he said. Galleria Designs is located at 405 Main St. next to the Lowe Hotel. It’s open from 9 a.m. to 5 p.m., Tuesday through Saturday and can be reached at 304-617-7102. Galleria Designs can also be found on Facebook.